I’ve performed in and directed many improv shows over the years. For many of these shows, I also wrote the press releases that went with them. These press releases needed to quickly get across the main idea of a show, what made it unique and worthy of people’s time, and pertinent information like time and place. Below and on the following pages are those press releases. For pictures, interviews, or media comps, contact Justin Davis at (512) 810-3537 or email Mr.JustinDavis@gmail.com. Intelligent, quick-witted, and charming. Dumb, silly, and potentially offensive. Both statements equally define new comedy panel show You Think You’re So Smart that’s coming to The Institution Theater in September that shares traits with British TV favorites Qi, Would I Lie To You?, and Mock the Week. Every Friday, from September 6 – 27 at The Institution Theater (3708 Woodbury Drive, 78704), You Think You’re So Smart show creator Justin Davis (The Next Chapter, theater producer/faculty member) will mediate a panel of smart people and smart alecks as they take on a wide expanse of topics that range from cosmic quandaries to the more Earth-bound fare of losers made good. This weekly show seeks to challenge panelists’ wits while entertaining and educating its audience. Because the majority of the panel will be made up of Austin comedians, occasional droll questions and the liberal display of faking it isn’t just permitted, but encouraged. A show with a segment called Ranter’s Corner, where a different pre-determined panelist each week has uninterrupted time to rant on a chosen topic, understands the pure humor found in a well-turned phrase. Smart hopes to turn its humorous and informative words over many times to its audience’s delight. Davis thinks Austin audiences are perfectly suited for a show based on an exciting mix of intelligent discussions, snarky combat, and likely innuendo-filled comments. 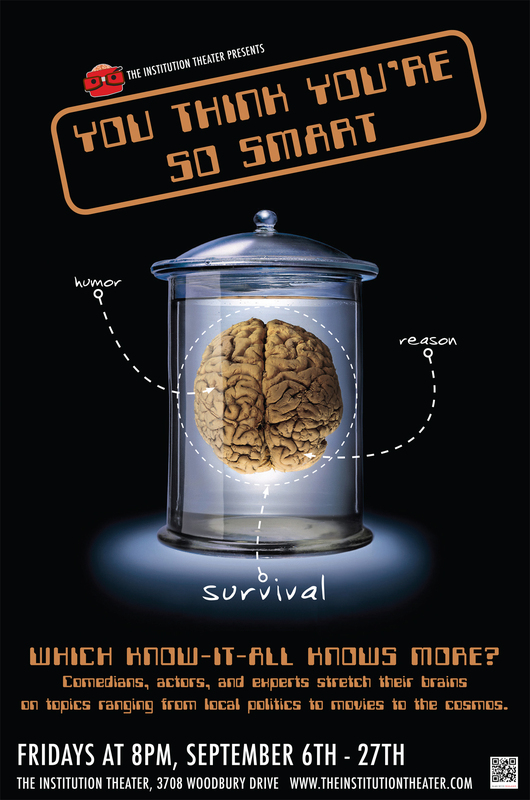 During the four-week run of You Think You’re So Smart, host Justin Davis will be joined by six panelists pulled from an impressive line-up consisting of: Mary Jo Pehl, Suzy Spencer, Asaf Ronen, Kareem Badr, John Ratliff, Aaron Saenz, Peter Rogers, Mia Iseman, Valerie Ward, Brett Tribe, Maggie Maye, Robert Faires, Andrew Buck, and Tom Booker. Which know it all knows more? Watch these fools try to prove that every Friday in September at The Institution Theater.